Considering the average rate of 6 new people moving to Bend per day over the past 5 years1, our town could eventually become a big city. But something has grown even faster than Bend’s population this year…namely, Bend’s Internet bandwidth speeds. The completion of a new multi-Gigabit fiber optic network in Bend in 2016 multiplied Bend’s former typical maximum bandwidth rate by 100-fold, taking it from a speed of a mere 100 megabits per second, all the way to 10 Gigabits per second. This officially makes Bend a “Gig City”! The new Gigabit network is a fiber-backed Internet ring constructed by BendTel, the 100% B2B locally owned telephone & Internet provider. So why is becoming a Gig City big news for Bend? Consider the buzz Google Fiber has enjoyed, despite being available in a select number of cities. True, much of the buzz stems from excitement over the raw speed. Also, Gigabit speeds are a rarity. According to the Oregon Business Development Department, there a fewer than 1 dozen known Gigabit providers in our state, mostly serving major metropolitan markets like Portland & Eugene. But beyond the unprecedented speed, beyond the element of novelty, what makes big bandwidth so exciting is its potential as a positive force economically. Just how impactful will having fiber-backed Gigabit Internet be on Bend’s economy? The impacts are likely to be felt soonest in the commercial real estate sector, as fiber is known to have a substantial impact on commercial property values and tenant retention rates. An MIT-published study of one market showed fiber-lit commercial buildings sold for an average of 30% more than their non-fiber-lit counterparts2. Meanwhile, fiber-connected residential units in multi-tenant complexes have been shown to rent for 11% more than comparable units in buildings without fiber3. Most importantly, Gigabit fiber services like BendTel Metro act as a strong attractant for businesses looking to relocate to a bandwidth-rich area. Since the initial BendTel Metro fiber ring’s completion, BendTel has progressed with expanding its fiber facilities even further, bringing buildings online at a steady pace since the beginning of the year. 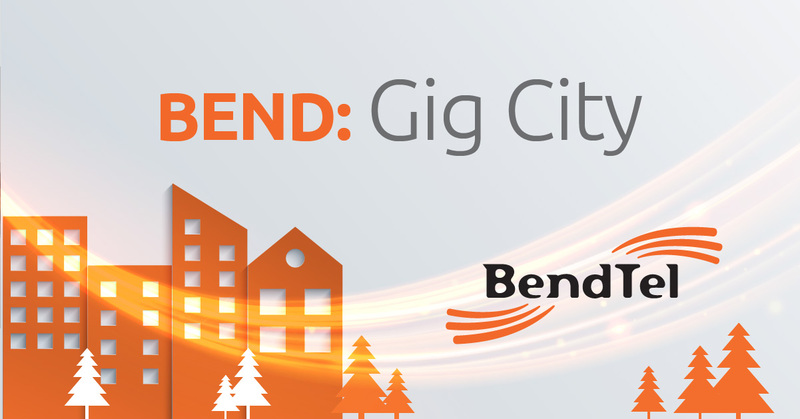 In September, BendTel notably became the Official Gigabit Bandwidth Provider to the Bend Chamber of Commerce, when it brought fiber into Downtown’s Old Post Office building, home of the Chamber. The prefix means 1 billion – in transmission terms, a Gigabit is exactly 1,000,000,000 bits4. BendTel’s fastest dedicated rate of 10Gbps is 100x faster than any rate typically available in Bend. So, whether or not you feel conflicted about Bend becoming a big city, becoming a Gig City is positive news that all of us can celebrate – especially those of us in the business community! US Census Bureau data relayed by EDCO, www.edcoinfo.com. Chegut, Andrea. “Why Technology Is Redefining Real Estate.” Mitcre.mit.edu , 2013, https://mitcre.mit.edu/uncategorized/why-technology-is-redefining-real-estate. Burger, Andrew. “FTTH & Apartment Rentals: Tenants Will Pay 5% More for Fiber.” Telecompetitor.com, 6/14/16, http://www.telecompetitor.com/ftth-and-apartment-rentals-tenants-will-pay-5-more-for-fiber/. Newton, Harry. Newton’s Telecom Dictionary 28th Edition, New York, 2014.